Living in the park in the city! That is the slogan used by the developer for this project. And successfully, because all apartments were sold within a heartbeat. That in itself doesn't come as a surprise as these apartments offer everything one can desire. 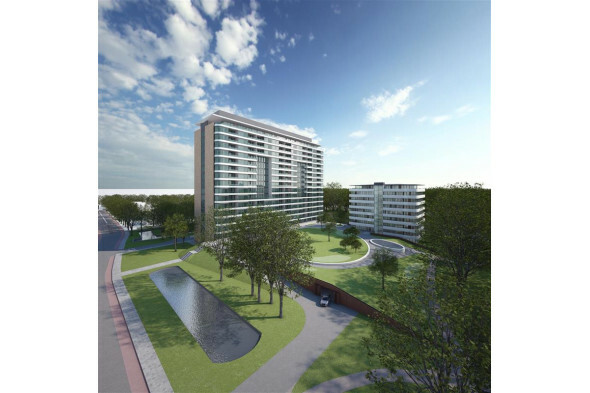 At an excellent location, within the popular and wealthy Benoordenhout area and directly next to the Shell headquarters, this project consisting of luxurious full-service apartments has been developed. Part of the Lage Duin building on the second floor one can find number 240. With ceilings at 2.85m and 154m2 divided over living room, open kitchen, hallway, 2 bathrooms and 3 bedrooms, this apartment offers all you need in terms of space and comfort. The Oostduinplein has been newly developed and finalised in 2019. 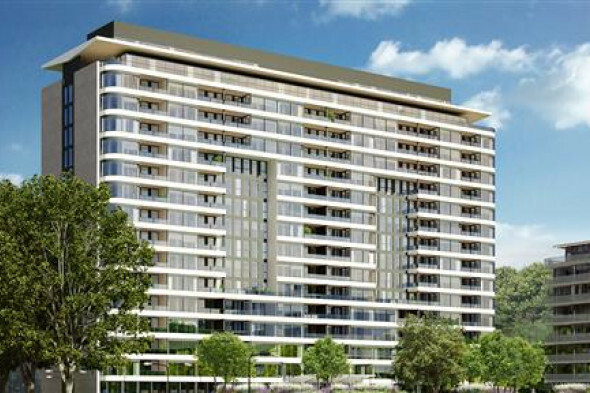 The project consists of 2 apartment buildings, a park and a subterranean parking and storage area. Where the Hoge Duin building is a redevelopment of a former Shell office building, the Lage Duin building has been completely newly built. Also the parking and storage area have been built completely new. The whole Oostduinplein oozes a luxurious feeling, with a lot of glass, high ceilings and a full-service desk that can provide all the services you would require, such as a chauffeur service or clothing repairs. And, in case you would not feel like exercising outside in the park or beach, then you can go through your routine at the indoor gym for residents only. The Lage Duin, which contains number 240, counts 8 floors, with at the top floor the penthouses. Each floor has 4 apartments. The glass elevators take you, while you enjoy a stunning view, quickly to your floor or parking area, where you can jump in your car or on your bicycle. At the second floor you can find number 240, a 154m2 spacious apartment. The high ceilings and the floor-to-ceiling glass all around gives this apartment an incredibly spacious feeling. You enter the apartment into a spacious hallway with a built-in wardrobe-closet and separate toilet. There are wooden floors throughout the apartment. At the end of the hallway, and through a gorgeous glass door, you enter into the living room (60m2) and open kitchen area. 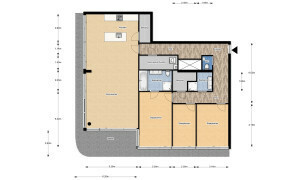 The kitchen has all the appliances and space you need: a kitchen island, ceramic cooker, dish washer and spacious oven. In addition, there is a separate American refrigerator and freezer. Attached to the kitchen, but through a door, there is a kitchen supply room (2.8m2). All around the living room and the kitchen area there is floor-to-ceiling glass, giving, together with the high ceilings, a very spacious feeling. From the living room one enters directly onto the balcony (32.8m2), which offers sufficient space for a table and chairs. The balcony continues fully around the outside of the apartment, which allows you to directly step outside from all 3 bedrooms as well. Bedroom 1, the master bedroom, is 17.9m2 and gives access to its own bathroom, equipped with a toilet, separate walk-in shower, double vanity, towel radiator and a bathtub. Bedroom 2 and 3 measure 9.6m2 and 13.3m2, respectively. A second bathroom makes this a true family-apartment, or at least one where you can regularly host family and friends. The second bathroom has a vanity, walk-in shower, closet and towel radiator. In addition, there is a large laundry room. All rooms have a CAT-6 connection, in order for you to directly connect your media-appliances to a high-speed internet connection, without depending on the volatility of WIFI. This allows you to work efficiently from home as well as quickly stream the movies and games for the downtime. In the technical area, which houses the heating-system, there is even more storage space for your needs. Each room has its own thermostat that controls the floor heating, which allows you to set the temperature for each room separately. Great if you like a warmer living room and a colder bedroom to create the perfect environment for a perfect night of sleep. Included in the rental price are 2 parking spots in the parking area below-ground, which also gives access to a storage room and a spot to park your bicycles. The luxurious apartment fits perfectly within the luxurious atmosphere of the whole project providing the service and luxury one can typically only find in other countries. Show all rental properties offered by Brickyard Makelaars B.V.